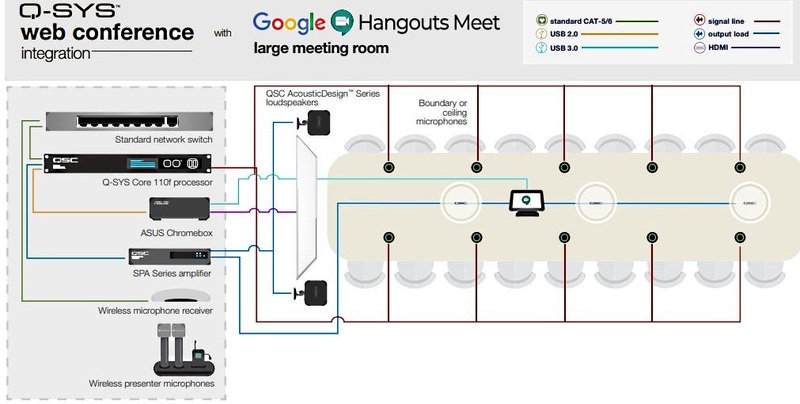 QSC announces a collaboration with Google Cloud that allows Hangouts Meet hardware users to easily extend their video conference experience to larger, more complex meeting environments by taking advantage of the audio processing from the Q-SYS Ecosystem. As part of this collaboration, the Q-SYS Core 110f processor is now certified for Hangouts Meet hardware solutions. This allows installers to integrate audio from Q-SYS Core 110f to Hangouts Meet hardware via a simple USB connection, giving it access to I/O count, software-based acoustic echo cancellation, room combining, and advanced EQ capabilities. “The flexibility of the Q-SYS Ecosystem is unlike anything on the market, and its IT-based design allows it to easily integrate with just about any of the latest meeting room technology, including popular web conference applications like Hangouts Meet,” says Greg Mattson, QSC product manager for Q-SYS Control. “Our work with Q-SYS and Hangouts Meet hardware is helping enterprises translate the ease and reliability of soft codec conferencing into these larger, challenging spaces like in open spaces for tech talks and extra-large meeting spaces. 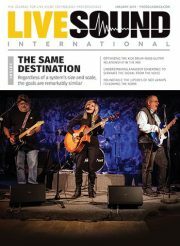 At ISE 2019 in Amsterdam, QSC will showcase how Hangouts Meet hardware audio integrates with the Q-SYS Ecosystem at its stand 7-R200.